Mash-ups of music and wearable tech were bound to happen. VR music videos - Bjork's pipped everyone to the post. And next year's festivals could replace tickets and cash with tech wristbands. The most interesting devices, projects and adventures in musical wearable tech, though, are concerned with the real business at hand: making and performing music. Imogen Heap's music manipulating Mi.Mu gloves didn't quite reach the musician's Kickstarter goal of $200,000 but they are the most mainstream bit of wearable music kit yet. The Mi.Mu gloves allow musicians and performers to manipulate music with gestures and movements (orientation, posture of hands, direction) rather than fiddling with faders, knobs, buttons and keyboards - raise your arms instead of turning up a fader, for instance. The aim is to break down barriers between musicians and tech as well as performers and audiences. The tech inside the gloves consists of an accelerometer, gyroscope, haptic motors, a programmable LED, Wi-Fi and flex sensors over the knuckles. As for the gloves themselves, they are thin, stretchy and hand washable. They also cost $1,200 per glove so it's quite the investment. Despite the price, a music/tech community has now built up around the wearable with Heap even inviting some Kickstarter backers to her house in January for a weekend of playing around with the glove's capabilities. Heap's first song composed with the gloves is fittingly titled Me The Machine. The team posted this on Kickstarter: "Collectively, you have formed the beginnings of the Mi.Mu community. While we didn't make our funding goal, we have found a way to move forwards by working with smaller groups, starting with our Collaborators. You can keep an eye on our progress and sign up for our mailing list at mimu.org.uk. There you'll find all the latest news and information about all Mi.Mu system hardware, software, workshops, demos, and the community forums." Mi.Mu is the most famous music making garment but other designers and makers have recognised the benefit of using the body in the composition stage. Pieter-Jans Pieters' project Sound on Intuition is a system of five 'instruments' including a collar around the wearer's finger to tap out, bend and stretch sounds and a heart rate monitor for rhythm. And Eugene Wang's Soundbrace concept uses Leap Motion and Myo tech in two wristbands for a spot of wearable Guitar Hero. I'm sat outside Euston station with LJ Rich, glitching for the first time. It's safe to say the BBC Click presenter is really into music and tech - she has a weekly music show on Periscope and is hosting Music Tech Fest's #MTFScandi hackathon at the end of May. But it's her experiments in sharing how she hears the world that get her really excited. Rich has synesthesia which means her senses are mixed up - seeing my colourful, patterned jumper triggers her sense of taste for instance and she hears the everyday sounds of cities as music - a lot of London is in B-flat apart from Oxford Circus (F major, like Shibuya, Tokyo). Her set-up for recording, glitching and sharing what she hears with friends and strangers is portable and wearable (in a loose sense of the word). The hacker-composer becomes a kind of tech one (wo)man band by attaching various devices to herself including a MacBook Pro or iPad in a backpack, wearing a wireless hotspot around her neck, an iRig Keys MIDI keyboard and an iPod sellotaped to her arm. She uses binaural headphones with microphones on the outside to record ambient sound, to get a sense of space and movement, and manipulating it in real time to allow people to hear what she hears. This isn't just the connected self, it's the connected individual. "I compose live on a walking tour with lots of headphones so it has to be portable," she said. "It's an augmented view of the world, it softens it and messes with reality. I'm obsessed with the idea of connecting people to music and there's a therapeutic aspect." As I sit with my headphones plugged into the glitching kit, the sound of strangers chatting, plates banging and chairs moving repeats until it becomes musical and Rich tweaks the outside ambient noise as well as a piano melody. It's private, immersive and a bit disorientating but it's also relaxing - I speak more slowly and suddenly start looking around me to identify what I can hear. Another of Rich's connected self projects is the Humming Engine - a group of four people hum into piezoelectric transducers attached to water bottles which work as contact microphones placed on the larynx. That's piped through a pre-amp, mixer and computer where Rich's sound processing program alters and mixes the humming to make it musical. It allows people to experience playing as a group if they have no musical tuition and without having trained to interact with an instrument or follow the protocols of, for instance, playing in a quartet. "For me it's all about live performance, physical experience and focussing on highlighting harmonies and melodies that I can hear and sharing them with my audience," said Rich. "Others music hackers I know are playing with the idea of time elasticity, body-linked music generation and the potential therapeutic applications of using sound as bio-feedback. I would love to explore ways we can use sound to massively manipulate our reality - perhaps in combination with a visual headset, or other sensory input." For those of us without heightened senses, or with sensory impairments, designers and makers are pushing the boundaries of how we experience external stimulation and how we are entertained. Wearable Experiments (We:EX) created the Alert shirt for sports fans who want to experience their favourite team's game in a heightened way or simply keep up to date with the game without having their eyes glued to a screen. The fan jersey takes real time sports data to control built-in vibration motors that allow the wearer to feel what the player feels in a subtle way. Looking into the applications for live music was an obvious expansion of the project. "The exciting part about haptics and music is that for someone who has a hearing impairment, their whole life has been about those vibrations of sound," co-founder Bille Whitehouse told Wareable. "This now means that we can physically translate a language of sound on the body, from intensity to frequency to placement on the body, that changes the feeling of the music. I like to call it the fourth dimension of entertainment." Whitehouse, her We:EX co-founder Ben Moir and their collaborators have started to experiment with how to turn live music into a "consuming, interactive environment" by translating it into haptic technology built into smart clothing. "To me, it was always about empathy," she said. "There are ways to build on that touch experience to get us thinking about sound. That's why we love it because it is physically like writing a song. You literally move the vibrations along like you would bars in music." Some wearable tech like the Alert shirt taps into new methods of expression and creativity using our sense of touch but other devices are trying to solve problems in the process of making and performing music with the same technology. The Soundbrenner Pulse, available to buy on Indiegogo until the end of April, is a wearable metronome which uses haptics to help musicians keep time and rhythm. Julian Vogels, co-founder of Soundbrenner, told Wareable he wants the Pulse to be a "fitness tracker for music" which can not only replace the annoying clicking sound of metronomes during practice but also track performance and progress. "You want to focus on the music you're playing, but at the same time you have to watch out for that click all the time," said Vogels, who plays synth and the drums. "It takes the passion out of music. With a vibrational cue, the rhythm comes to you naturally – just as if someone taps on your shoulder." The wearable can be worn on your wrist, your upper arm - say, for guitarists or pianists - or around your ankle which would suit drummers. Soundbrenner is selling packs of Pulse devices as it can be used both solo and with the whole band synced plus it can be connected to software such as Logic Pro and Ableton Live. 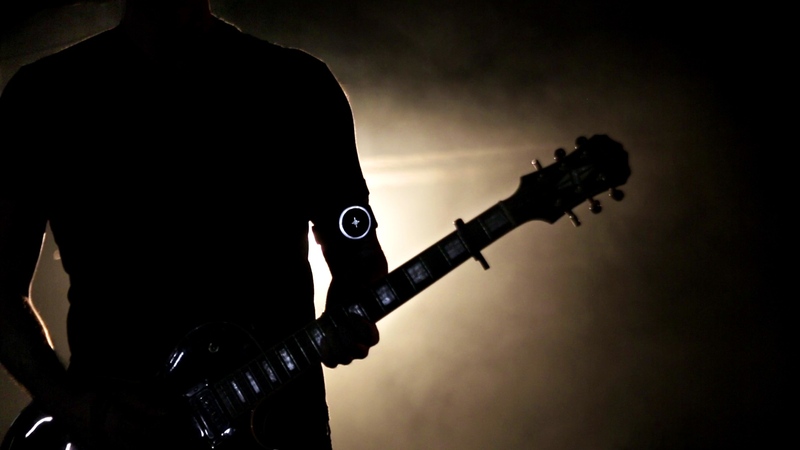 The team, which is based in Berlin, has worked hard to tailor the device to how musicians will use it. That isn't surprising considering that it includes a concert violinist - Soundbrenner's Head of Finance Ving-Nghi Tiet who came up with the original concept - as well as ukelele, Nepalese flute and piano players. Vogels is also adamant that the Pulse works as a specific device built for musicians but wouldn't work, for instance, as an Apple Watch app. "Apple's Taptic Engine isn't strong enough for musicians who move around a lot when they're playing and use instruments which emit their own vibrations," he said. "The Apple Watch can't provide sufficient battery capacity to run haptic feedback for extended periods of time and Apple restricts access to the vibration motor for app developers. It's not possible right now to develop an app which makes the Apple Watch vibrate." There's scruffy, shoegazing guys playing guitars performing and there's retina overloading, slick, expensive stage show performing. Wearable tech can come into its own during the latter. CuteCircuit, a wearable tech fashion house based in London, is best known for designing showstopping LED infused dresses for pop starlets such as Katy Perry and Nicole Scherzinger. But in 2009 the team created four interactive jackets for U2's 360 tour. The leather jackets were embedded with 5,000 pixels each which were able to recreate dynamic patterns and video, wirelessly synced in real time to the music, stage lighting and visuals by the lighting desk. The set-up used Q, the live performance software designed by CuteCircuit, to bring together the futuristic city set on stage and the wearable tech garments being worn by U2. And it wasn't a one-off. "We can empower the teams to control our garments from the lighting desk," said CuteCircuit's creative director Francesca Rosella, speaking at Re.Work's Internet of Things summit. "Lots of artists are touring with it all over the world." CuteCircuit's Q tool is now also an iPhone app which can be used, for instance, to change the colour of the lights on the tech dresses and skirts. The motivation behind the design of bags that can show tweets and dresses that can change colour is to enhance self-expression. And while most of us might be too private to broadcast our mood or our Twitter feed to the world, pop musicians have no such issues. "In the future, in five to ten years, clothing will be more about self expression but also communication and sharing our emotions," said Rosella. "People forget about emotion."